Before today, it's safe to say I hadn't seen or heard the name Scott Crossfield, or thought of him, in at least forty five years. But when I was about the age my daughter is now (she's in sixth grade), Crossfield was one of my heroes. He was a test pilot for the National Advisory Committee on Aeronautics, or NACA (the forerunner of NASA, before anyone was bold enough to put "space" in the name), who, in 1953, had flown a beautiful swept-wing rocket-propelled plane, the D-558-2, at Mach 2, twice the speed of sound. Later, he flew the same craft to a new altitude record. Later still, flying a more advanced plane, the X-15, he became the first to exceed Mach 3. Yesterday his body was found in the wreckage of his single-engine prop-driven Cessna, the same sort of plane I learned to fly in the summer between my junior and senior years of high school. At 84, he was still flying solo. As with so many airmen, a sudden encounter with bad weather was his nemesis. Early Saturday morning, we heard the throaty blasts of a great ship's horns coming through a thick fog. 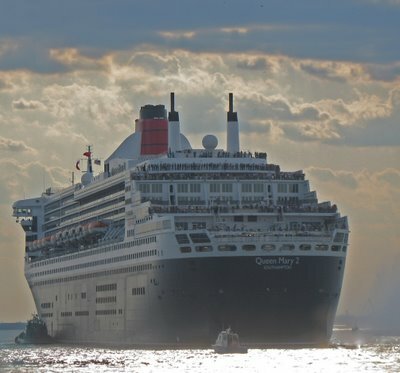 It had to be Queen Mary 2, all 150,000 something gross tons of her, coming to dock for the first time at her new berth in Brooklyn. 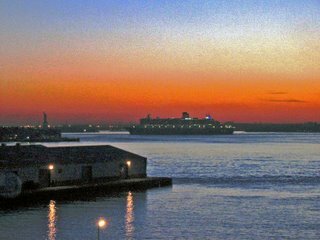 Yes, Brooklyn will now be her terminus on the western side of the Atlantic, from which, during the summer, she will maintain a regular service to Southampton, just as her Cunard Line predecessors did years ago, and in the fall and winter she will set off on cruises to the tropics. I had seen her before, sailing into and out of the Hudson, getting the photograph above of her departing at dusk. I had also seen her tied to the pier at the foot of West 55th Street, almost exactly where, at the age of five and from the observation deck of the Empire State Building, I had seen the old Queen Elizabeth docked during my first visit to New York in 1951. 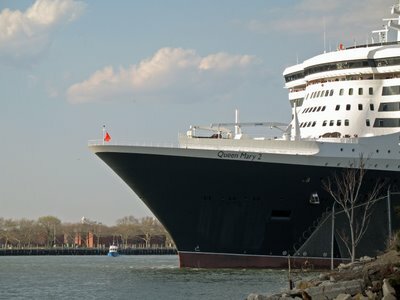 When I saw QM2 docked last year, she was longer than the pier, her stern jutting well into the river - no doubt a dicey situation because of the strain the Hudson's tidal currents put on her mooring lines. So a new place had to be found for her, and the other huge ships being put into cruise service, to tie up in New York. (Some had, to the horror of New Yorkers who care about such things, begun using an extra-long former military pier in Bayonne, New Jersey.) Brooklyn came to the rescue with Pier 12, a disused former breakbulk cargo berth lying at the seaward end and parallel to the Buttermilk Channel, a strait separating Brooklyn from Governor's Island. 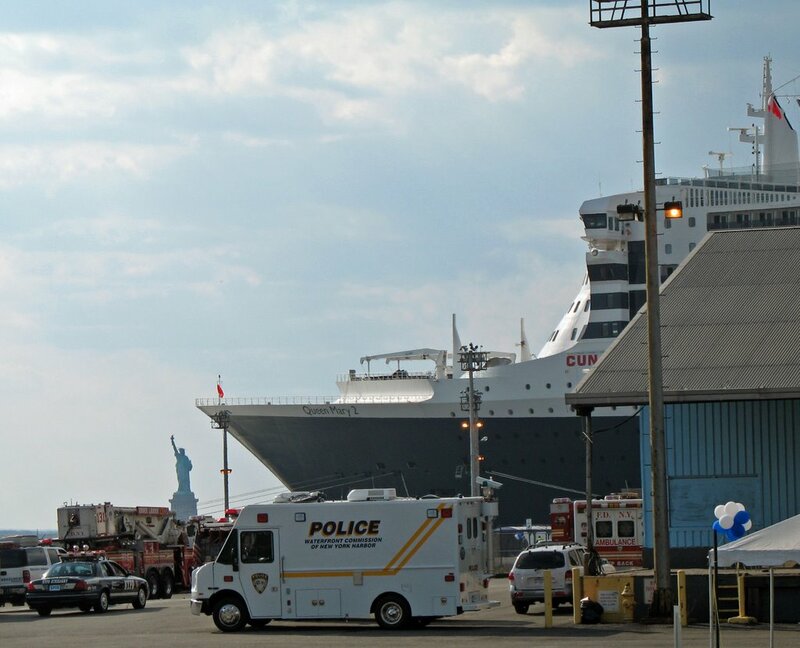 A new passenger handling facility was built there, and when I read that this would be where QM2 would dock, I realized I was about to realize a childhood dream: to live within sight of where great Cunarders berth. When the fog cleared, I went across the street to the Brooklyn Heights Promenade and looked to the south. I was pleasantly surprised by how close the great ship's berth seemed to be. 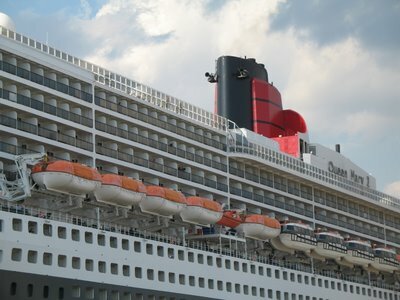 Knowing QM2 was to sail at 5:00 P.M. , I resolved to walk down to Red Hook, the neighborhood where she docked, in time to photograph her at her berth and as she sailed. That afternoon, I walked and walked, realizing that the ship's enormous bulk had fooled me into thinking she was closer than she really was. 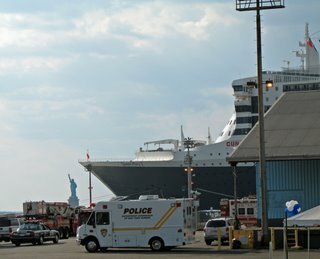 After hiking about two and a half miles, I got to the corner of Prince and Conover Streets, where I saw this juxtaposition of QM2's severely raked bow and the distant Statue of Liberty. I realized, however, that this site would not afford a good view of the ship's departure, as buildings behind me obscured the view of the channel to seaward. So, I walked back to Conover Street and headed south. At the foot of Conover, where the land curved around eastwards, I found just what I had hoped for: a public pier - the "Valentino Pier" according to the New York City Parks Department sign - jutting out into the harbor. There was a sizeable crowd already gathered to watch QM2's departure, but I was able to find a vantage point near the end of the pier. Just to my left was a police boat, part of a heavy presence of gendarmarie for this high-profle event. 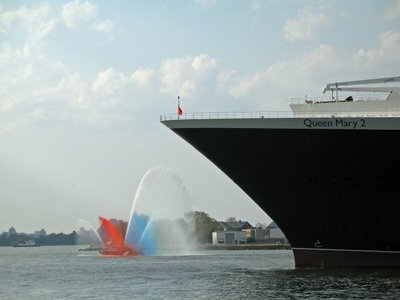 After a few minutes' waiting, I was rewarded by three blasts of QM2's horns. A short while later, her bow emerged from behind warehouses and a rocky promontory. 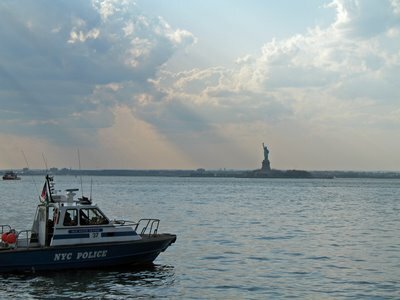 As she sailed past, a fireboat in the harbor began to salute her with red, white and blue plumes of water.